Since Fort Wayne’s establishment, our three rivers: the St. Marys, the St. Joseph, and the Maumee, have been an intrinsic part of the city. From adventuring the trails along the river, to getting out onto the water, there are plenty of opportunities for you to experience and bond with nature! Play – With a Treetop Canopy Trail, Hands-on Kids Canal, and Accessible Playground, Promenade Park offers families interactive options for FUN! Explore – Extensive river access points and new opportunities to get on the river enable visitors to enjoy scenic boat tours or head out on their own in a rented kayak. Relax – Dining and park experiences offer opportunities to “hang out” and enjoy the views any day of the week. Celebrate – Promenade Park houses a state-of-the-art concert shell and amphitheater – promising concerts and live music experiences throughout the season. We’ve designed a few water trails to help you chart a course on our rivers. If you’re ready to venture onto the waters, you can do it by canoe, single or double kayak, or standing paddleboard. Fort Wayne Outfitters rents all three at hourly, half-day, and full-day rates. You can also rent canoes or kayaks from Earth Adventures Unlimited. This is a great way to see the city! Check out a few of our suggested water trails here. 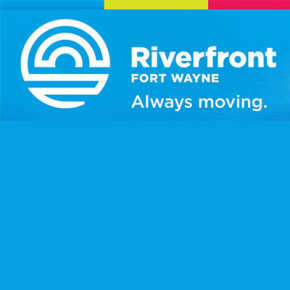 Experience the city by taking a boat ride on one of the three rivers in Downtown Fort Wayne. Canal Boat - Travel Fort Wayne Rivers on Sweet Breeze, Fort Wayne’s authentic 1840s canal boat replica. This is not a boat ride, it’s an experience! Both 90 and 45 minute tours are available to entertain riders with colorful river lore stories, Fort Wayne history from the riverbank and muddy water tales. You’ll leave your voyage knowing more about our city, our heritage, and our water supply. 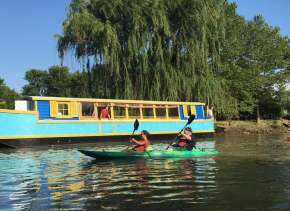 Captain Black Boat Tours - Enjoy tours of the St. Marys and St. Joseph Rivers in Downtown Fort Wayne with a pontoon ride provided by Fort Wayne Outfitters and Bike Depot. Departs From: Varies. Please confirm when you book. 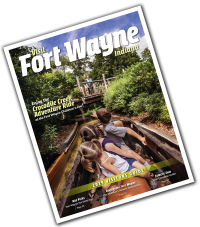 Riverfront Fort Wayne Boat Tours – If history is your thing, grab a seat aboard one of the tour boat rides presented by Riverfront Fort Wayne and the Fort Wayne Parks department. Departs From: Varies. Typically Headwaters Park West. Please confirm when you book. Airboat Rides – Feel the breeze, and take a fun airboat ride. Rides are by reservation only during the evenings of Thursday, Friday, and Saturday evenings 6 pm – 9 pm. River City Ventures – A unique Party Barge experience. Groups of up to 16 can book this floating bar for a tour on the rivers. Kraken Cycle Boats – NEW – Pedal along with your friends on this new addition to the rivers. Fort Wayne is home to 86 parks and more than 90 miles of trails, the most prominent of which is Rivergreenway. The Rivergreenway Trail stretches 25 miles from Fort Wayne to New Haven, winding along the banks of the rivers. 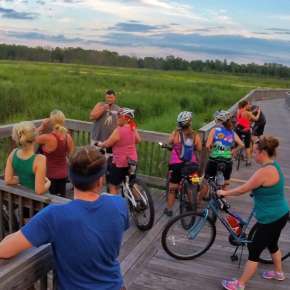 This trail is perfect for walking, jogging, rollerblading, biking, and more. Plan your trail walk or bike ride with this Trails Itinerary or print a map for handy navigation. We&apos;ve created several water trail routes for you to enjoy. 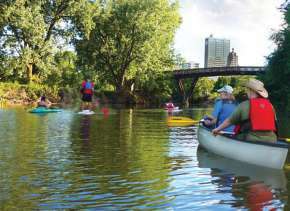 Rent a kayak or canoe from Fort Wayne Outfitters and take to the rivers! Rent a bike with Fort Wayne Outfitters who make it easy for you to hop on a trail and enjoy the river scenery. 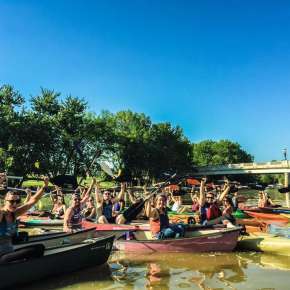 In the coming years, you’ll find even more ways to explore the rivers as a result of the RiverFront Fort Wayne project, a plan to develop the rivers and make them more accessible. Art Benches – Take a stroll along the Fort Wayne Rivergreenway and make sure you stop to take a break on one of the benches decorated by local artists. Riverfront areas will be under construction in 2019. Click here to see a map of closures and detours.